Genre Week- from music to film, to lifestyles and environment, this week is all about different genres and the blending lines between them. Siblings Week- for your brother and sister! This week will explore the Kuti family, drama between the Oasis brothers, the evils of the Koch brothers empire, and more. Book Week- looking at musicians as authors, the Kindle putting Boarders out of business, and the new American gothic- vampires! Radio Week- from being your own DJ to DIY radio, we’re gettin’ down with all things… well… us! And more, of course. THEN We bring you…. drum roll please…. HALLOWEEN WEEK!! Check back with BTR for all your spooky music, news, and videos! Also up for October is our newest contest, appropriately titled…. another drum roll… ROCKTOBER!! Bahaha. Yes I know, we’re very creative here. Check it out, just as simple as our other contests, but on a larger scale- we’re directing this one towards college radio stations. Each station will make a promotional video, audio clip, or picture for their station and post it on our Facebook wall. Then, they get all their fans to ‘like’ that post and the school with the most ‘likes’ wins! There two prize pools, so that big schools can’t outvote little school by sheer population. What are these prizes, you may ask?? Well, for each pool, the big winners will receive $1,000 to Apple for new equipment and a guest spot on BTR. Second runners-up will be granted $500 and $250 for the third place winners, all to help your school’s radio station in the fight to keep radio kickin’! Questions or concerns? Voice them on our Facebook page, or email me at carlybtr@gmail.com. Last order of business is a shout out to our blogger buddies out there in Internet land. Annalisa at Slightly Single was lovin’ the video of Pree we sent her. In this video, Pree performs their single, “Old Form,” and on this blog, “being single means not having to share my daim cake.” We hear ya, sister! And last month, we got two fly cats posting about our Lightouts video!! The first wad Clif at The Dadada, who threw our video in with his Sunday wrap-up. The second was at Migrate Music News and Lightouts got a special little article all to themselves, with a free download of their song “Only the Smart Ones,” which they performed in the video! We’re doing a lot this month, got a ton more on the site and on our Facebook, so don’t forget to check those out and shoot me an email if you have any special requests! Let’s RADIO yall!! Before I get all gushy with love for our blogger friends, I just wanted to let you folks know about the easiest contest on the planet. If you don’t play, you’re silly ’cause this battle is already won. All you have to do is go to our Facebook page and post your favorite summer song this year. Do this and you’re automatically entered to win a pair of Urban Ears headphones. Um… COOL. Also on a Facebook note- we wanted to make things a little easier on you guys as far as knowing what’s coming up in the week on BreakThru Radio.com so we’ve decided to post our program guide. Check the notes section every Monday for a comprehensive list of all the goings-on at BTR! Definitely worth checking out if you want to just go straight to your selected content. Now- we’re getting so much love over here at BreakThru Radio and we just need to say- THANK YOU!! WE LOVE YOU TOO!! Pledge Music thought our Tracy Bonham video was sweet, and they posted it on the blog for all to see!! Check out the post here! 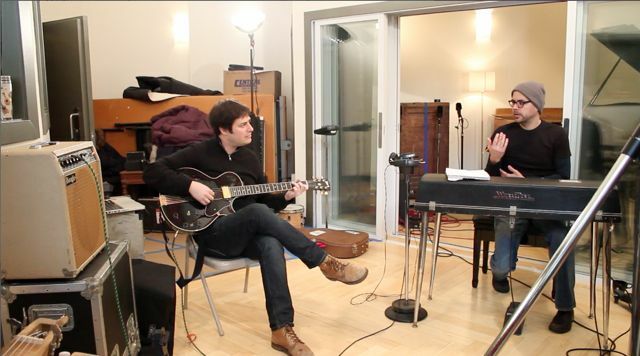 Our buddies up in Toronto, MusicPsychos, loved the Dinosaur Bones live studio video we did. DinoBones made a big impression on the Canadian music scene, and we were super happy to hear that the natives thought our video was good! Our buddy Greg at Perfect Porridge was digging the Cassettes Won’t Listen video we shot a couple weeks ago, and lucky for us, he got all his fans on it too! Main man Mark from Punk Rock Ist Nicht Tot was ragin’ to the A Million Years video. He’s got way more than just punk, so don’t be turned off by the title and go check it out! The Converse Rockstar– a great music blog featuring articles from budding writers and blossoming musicians! Gold Soundz– with reviews, articles, videos, and more! They also really dug TWO of our other videos! The Fort Lean episode which gained a lot of attention, and the Sherlock’s Daughter shoot– both awesome! This past week’s episode of our original series, The Pulse, examined food trucks on the streets of NYC and their impact. See what people on the street had to say in the post from LookyTasty.com! wasfuersohr– a music blog, with a German twist! Another one from The Converse Rocker– thanks for lovin’ our stuff over there!! Planet Music Reviews– an excellent source for music news from all over the globe! Thanks for stopping by the blog! Be sure to check out BreakThruRadio.com, we’re on Facebook and Twitter and we love to hear from our listeners, so please don’t hesitate to reach out to us! As the blog author, I can be reached at carlybtr@gmail.com- use it or lose it friends!! New Contest, New Music, New Everything on BTR! Hey BTRers!! We’ve got more fun stuff to win this month on BreakThru Radio with perhaps the easiest contest ever invented!! All of July, we’re asking our listeners, who is your favorite BTR artist? All you have to do is post a comment to our Facebook page naming your favorite musician who we play on BreakThru and at the end of each week, we’ll randomly select one winner! The prize? A brand new pair of Urban Ear Headphones! Head over to BreakThru Radio on Facebook for full details! Next, I wanted to give some love to all of our blog supporters we have out there- check these blogs and websites for new music and bands, all the news updates you want from the indie world, and more fascinating music stuff that you can’t find any where else. Perfect Porridge is a blog based out of Minneapolis, MN but it covers music scenes all over the country. Bands send them albums and tour schedules to review, and they’ll post cool videos/articles sent to them by other sites. Our buddy Greg at Perfect Porridge really dug the Cassettes Won’t Listen video where he performed “Perfect Day” off his new album, Evinspacey. Check the post here and be sure to check back with Perfect Porridge every day for new, exciting content! Thanks Greg, and all at PerfPor! Jayce over at Pledge Music was also diggin’ our stuff recently. They posted a link to a video we made of Tracy Bonham in one of our Live Studio Sessions where she really kills it with her beautiful violin skills. PledgeMusic describes what they do better than I ever could, so I’ll let them do the talking: “PledgeMusic provides fans and artists the opportunity to work together to make new records and raise money for charity. By combining new social networking technology, old school music biz know how and an irresistible menu of exclusive incentives, fans can visit the site to hear great new music, enjoy and share unique experiences with the artists they love and actively participate in the release process.” Sounds great to me! Don’t forget to keep up with PledgeMusic- maybe they’ll help you out someday! And we couldn’t possibly forget Shawna at Sound Vat, who loved the Toronto band Dinosaur Bones that we featured a couple weeks ago on Live Studio. Sound Vat is a platform for all things Canadian, but specifically the Canadian music scene and all it has to offer- probably way more than you think! Keeping tabs on Sound Vat will ensure you never miss the great music coming out of the northern-most parts of North America, but for now, definitely hit up her posting of Dinosaur Bones! More to come from the BTR Blog, but so long for now! Lots going on at BTR! Hey Friends, we’ve got a lot going on here at BTR that has forced me to be away from the blog for some time, but let me fill you in on all this fun stuff! First and Foremost, we’re hosting a special BTR contest to win an iPad 2! 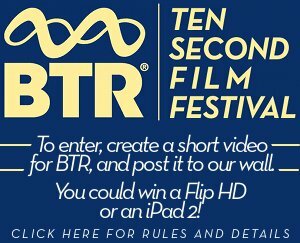 All you have to do is make a 10 (or less) second film regarding BTR in any way- it can be a sign that says BTR, you can give us a little wave and shout out, it can relate to any of our shows, videos, articles, or the theme week. And then just upload the video to our Facebook page for a chance to win!! Very simple, click here for official rules and details! Back in 15 Minutes is a blog by Toronto based music journalist Lucas Samuels and it features tons of different interviews and artist mixtapes. It’s a really cool blog and he’s been awfully lucky to get some of these exclusive interviews. Click here to check out his posting of our Yellowbirds video! David over at Jaxscene showed us some serious love with a posting of the BLORR video from a couple weeks ago. Jaxscene has all the best new bands and events happening around Jacksonville, FL, but also brings you the latest updates and news from the indie rock scene. Peep the BLORR post here. I also have to give a shout out to Amber at Element for posting our Joanna and the Dusty Floor video. She loves Joanna Cranitch, as do I, and her simple, poignant video was front and center of the Element blog when it went live. Click here to see the full Joanna posting. Lastly, Sam from Plant Music Reviews gave us the thumbs up with a posting of our Peggy Sue video. PMR is a leading source for show/album reviews and discovering new bands, so definitely hit up their site to browse all their content and to check out the posting! Well, we’ve got a ton more stuff coming up for all our listeners out there. Be sure to LIKE the BTR Facebook page and follow us on twitter @BreakThru Radio. There’s always exciting stuff to share and be involved with, so don’t hesitate to comment on the site, send us an email, or leave messages on our social media platforms. We love to hear from you! More to come, music lovers!